Issue 22.1 is here! Subscribers should be receiving the new issue in the mail any day now. 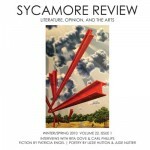 This edition is packed with exciting content, including interviews with poets Rita Dove and Carl Phillips, fiction by Patricia Engel, and the winning entry of the 2009 Wabash Prize for Poetry. You’ll also find great creative nonfiction, art and book reviews. Be sure to check out the full table of contents, where you can read excerpts of stories, poems, interviews, and art featured in the journal. Then order your copy today!